Well it’s official, the AREG is now active on Clublog. So I’d invite all members that expressed interest in joining the AREG to Clublog to log in to their account and update your profile. Clublog is a online tracking tool, it analyses all of our QSO’s and will tell you all sorts of interesting stats and figures about the countries you’ve work, when, where and how often. It also means that other members of the club can find out when you worked a particular DX station and assist them doing likewise with the path finding tools. It can go a little way into confirming your last QSO with the log checker. If you are into working HF DX even if you prefer using a paper log, entering your QSO’s and uploading them to clublog will give you a pleasant surprise. 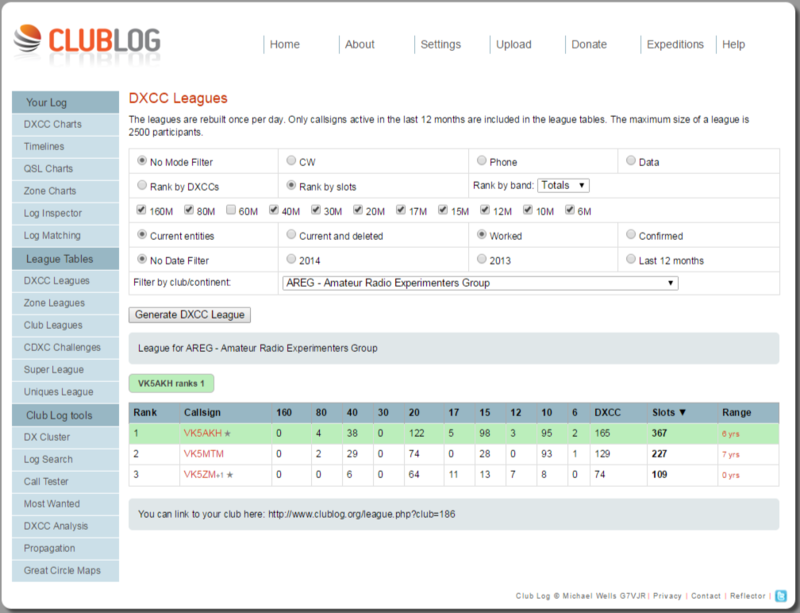 Now it also means that the AREG will appear in the Club DX league tables, once we get more than 15 active members using clublog regularly (one upload a year is regular enough apparently). It also means we can see our own progress among club members using the AREG club log page. Anyway to join Clublog you simply register, to join the AREG club within club log you just need to update your profile and the admin (yours truly) will approve the registration. I’d like to thank the members that have donated to Clublog, this was certainly recognised by the Clublog team. I’d also invite AREG members that find the Clublog experience rewarding to also donate. Since Andy and Theo introduced me to it 6 months ago I’m hooked, after every upload I find myself looking at all sorts of interesting stats and learning more about the country that I just worked. If anyone wants more information or help regarding Clublog and AREG then contact Matt VK5ZM.